Mamet’s early play still packs a punch. A gritty production at the Geffen Playhouse. The machine-gun like staccato of David Mamet dialogue, along with a load of coarse language and tons of f-bombs being hurled from the stage, is evidence that “Mamet-speak” is alive and well on the stage of LA’s Geffen Playhouse. 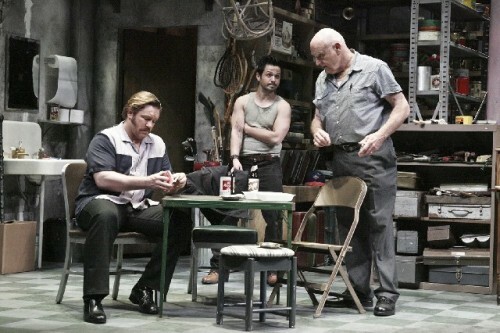 “American Buffalo”, the dark, absurdist, comedy about a trio of inept burglars and a heist gone bad is considered one of Mamet’s best early plays. Directed by Randall Arney, the Geffen’s Artistic Director, “American Buffalo” features three marvelous actors: The burly and physically intimidating Bill Smitrovich plays Don Dubrow, the owner of a resale junkshop; a wonderfully gifted Freddy Rodriguez who plays Bobby, a young man whom alcohol and drugs has reduced to a shell of a man living in a continuous, semi-detached state of reality; and Ron Eldard as Walter Cole (called Teach), a small-time, wanna be crook and a bipolar manic depressive, whose violent nature and reaction to frustration propels him into fits of destructive behavior. In other words, when these three characters get together, dark comedy and mayhem can’t be far behind. Here’s the caper/heist plan dreamed up by Don: They rob the coin collection from a customer of Don’s. In the collection is a rare American buffalo nickel that Don sold him a short while ago. Don finds out the customer will be away for the weekend, which then becomes the perfect time for the anxious, but inept, trio of misfits to complete the job and split the profits when the rare nickel is sold. We’re not dealing with brain surgeons here, and this simplistic plan looks to everyone like a slam-dunk. If only plans and life were that easy and simplistic. The actual heist, which everyone is so keyed about, keeps being postponed, much to the frustration of Teach. He’s not long on patience and can easily explode at any moment. Also, he wants to edge Bobby out of the plan. He keeps saying to Don, we need a man to do the job for the break-in, not a young drugged out kid. Don is not moved. He likes Bobby; telling Teach that Bobby will be fine for the job. Their relationship has tones more like a father-son feel to it. Mamet works on more than one level as a playwright. His sub-text is as important in understanding his characters as the dialogue they spit out at mind-boggling speed. 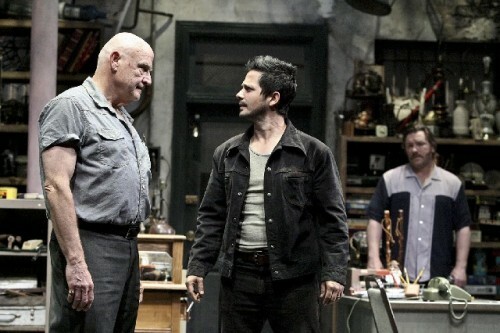 In Arney’s production of “American Buffalo”, after one peels away all of the f-bombs, we are left with a gritty study of three American men who are unable to understand their role in a society, which views them as losers and permanent bottom-feeders. In Mamet’s most successful play “Glengarry Glen Ross” his theme of hard- scrabble businessmen constantly trying to beat the system, is what resonates with American audiences. Enough, however, cannot be said of the splendid ensemble cast of “American Buffalo”. They grab Mamet’s absurd black comedy story and elevate it to a gritty, but engrossing evening of theatre. Randall Arney has retold and seamlessly directed a classic American play, one that when it debuted in Chicago’s Goodman Theatre in 1975 went on to Broadway in 1977 and just blew away both audiences and critics alike. His 2013 Geffen creative team includes Set Designer Takeshi Kata who provides one of the messiest looking sets I’ve ever seen, and one where grunge creatively oozes from every corner of the set. The Costume design by Chrisi Karvonides-Dushenko, and the Lighting design by Daniel Ionazzi are also first-rate. 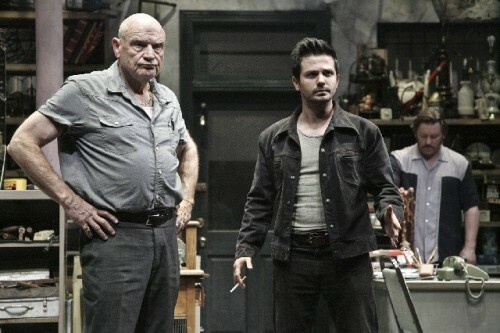 “American Buffalo” performs at the Geffen Playhouse, and runs through May 12, 2013.